You can order your Vietnamese licence translation online in under 5 minutes by clicking here. Need your Vietnamese driver’s licence translated into English in Australia so that you can drive a car or vehicle whilst you are travelling in Australia? Our professional NAATI accredited translators at Licence Translation can assist with providing you with a Vietnamese driver’s licence translation for an exclusive online price from $69.00 per licence! The translation of your Vietnamese driver’s licence that we provide is fully NAATI accredited and certified, allowing you to use your licence to drive around Australia! 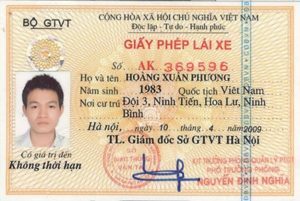 How long does it take to have my Vietnamese driver’s licence translated into English? The English translation of my Vietnamese driver’s licence was accurate and sent back to me within 4 hours. Excellent service and highly recommended for anyone who needs an Vietnamese driver’s licence translated into English. Incredibly grateful for your fast service. Using your website was very simple and the NAATI certified translation from Vietnamese to English of my licence meant that I could get my Victorian driver’s licence – thank you. For translation of Vietnamese driver’s licences into English, our pricing starts at just $69.00 per licence.